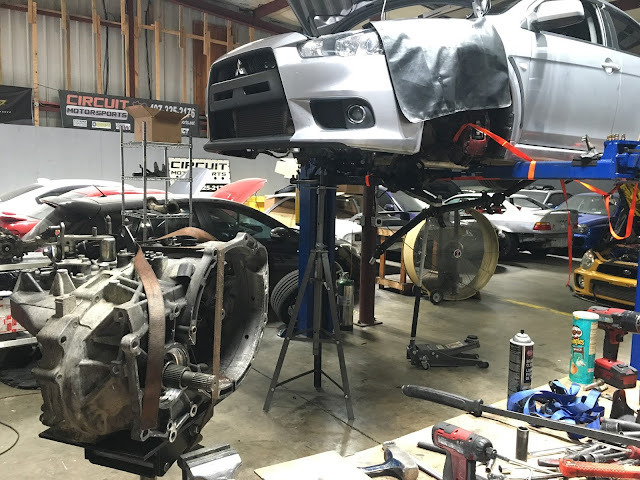 Circuit Motorsports: Flat-Out: EVO X Clutch install, repairs, and upgrades. EVO X Clutch install, repairs, and upgrades. 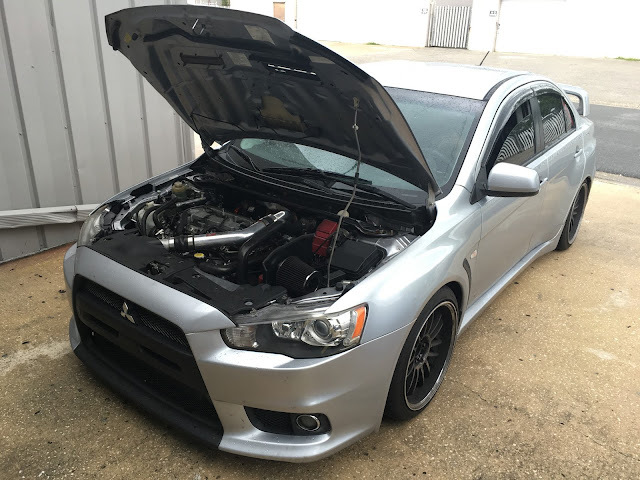 We just finished up a clutch install and repairs on this Mitsubishi EVO X! This car came in with a clutch that was barely drivable. 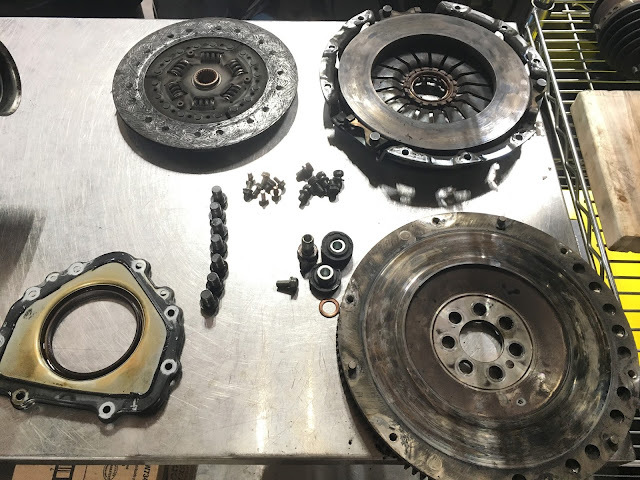 So we set to work getting the transmission out so we could inspect the issue and replace the clutch with something better, what we found is an issue that’s common with aftermarket clutch replacements! A clutch replacement on an EVO X is no small task, as the engine and trans mounts need to be loosened, the subframe dropped for clearance, the transfer case removed, and the transmission removed as well. This takes time, and the help of a few hands. 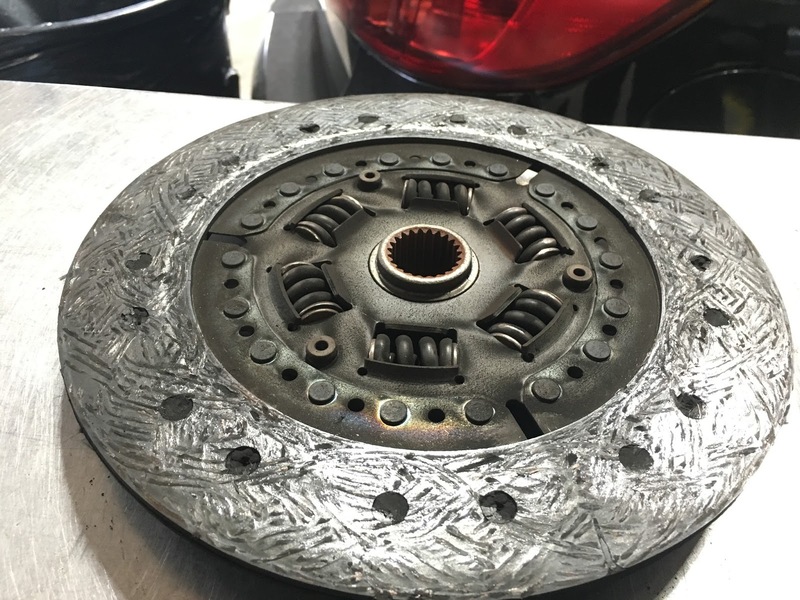 Once we finally had the car disassembled the issue was apparent, the clutch disc was no longer concentric with the pressure plate, causing the extremely rough driving conditions the owner was experiencing. 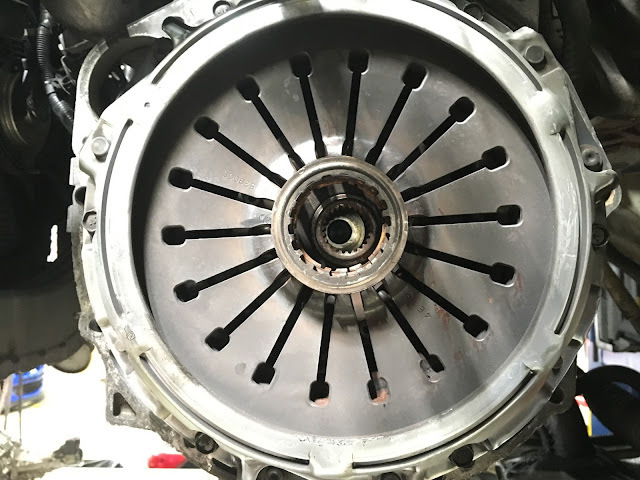 Once we had the clutch assembly out the problem was clear; The flywheel was badly hot-spotted and cracked, with uneven wear across it’s face. This can happen when an aggressive clutch disc is used. Unfortunately, it looks like this flywheel was re-used with a new clutch disc at some point without being serviced or resurfaced. This caused the clutch disc to wear unevenly and vibrate itself to death. Always use a new flywheel or service the old flywheel *IF* it can be. This EVO is getting an all new ACT clutch kit and flywheel, so we will be getting rid of the problem clutch components altogether. We set about cleaning up the transmission bellhousing and greasing the input shaft. 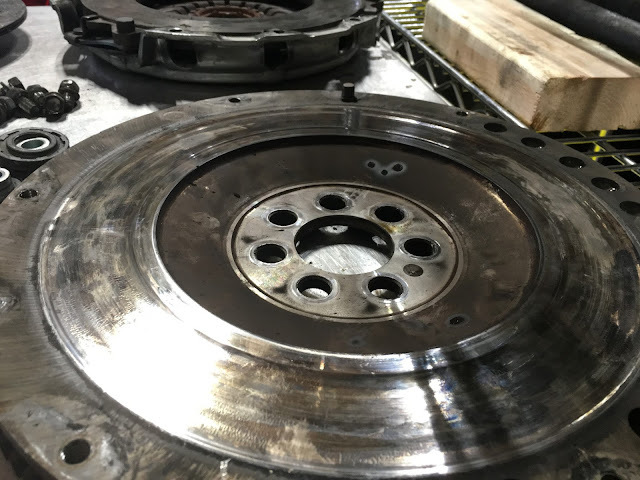 A new Throwout bearing was installed and then checked for proper operation. 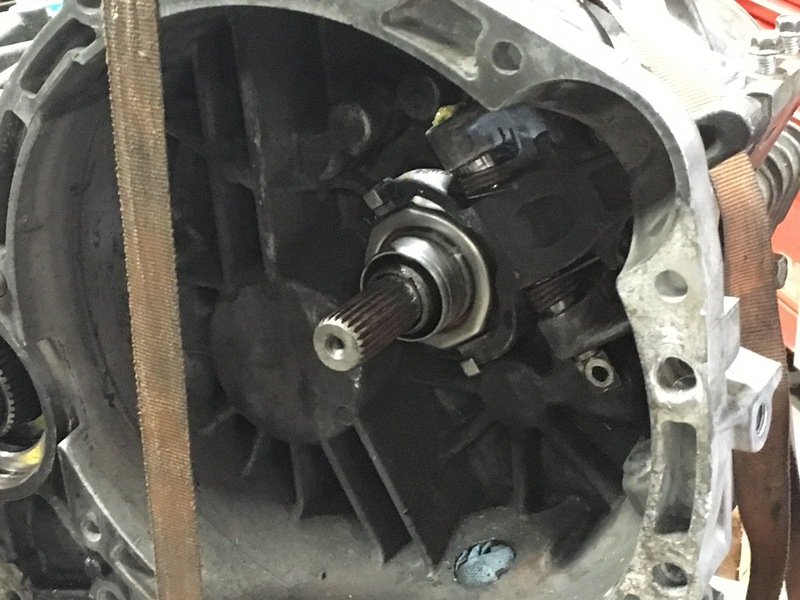 The ACT Streetlite flywheel got a new Pilot bearing, and was installed with new flywheel bolts, torqued to spec. 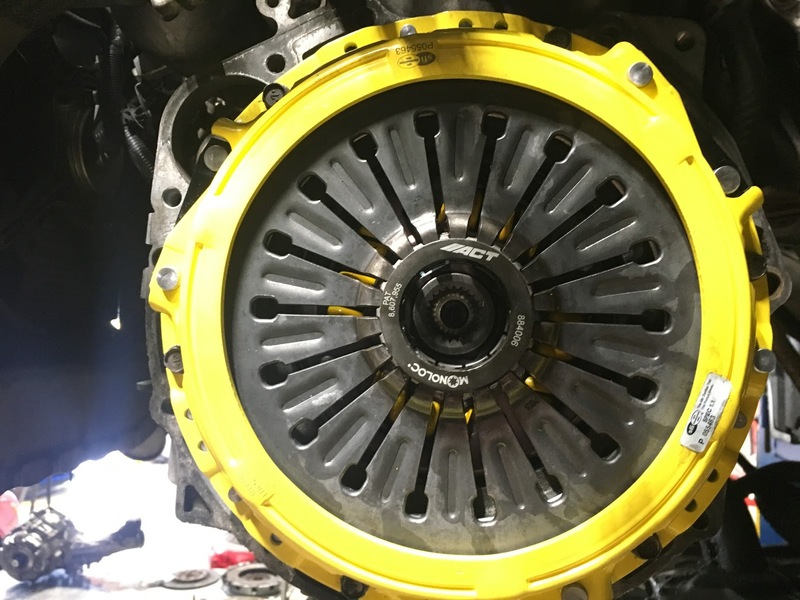 The HD clutch kit was then installed, checked for alignment, and torqued to spec. Everything lined up and it was ready to go! We replaced a few other items before bolting the transmission back in place. The Rear Main Seal had been leaking for some time, so that was removed, the area cleaned and prepped, and the new gasket installed. The Transfer case was cleaned up and new o-rings installed. All new crush washers were used for both the T-case and the transmission. When doing a big job like this it is always a good idea to replace any o-rings, seals, or gaskets. A few dollars here can save a lot of dollars later! There was also a long list of items not installed correctly, or missing from what looked like a poor clutch replacement at some point in this car’s history, so we remedied all that we could while the EVO was on our lift. Control arm bolts were loose, coilover spring perches were not tight, missing heat shields, loose hose clamps etc. There were some more serious issues including 2 transmission bolts that were missing, 2 transfer case bolts missing, a transmission mount bolt missing, and a steering shaft held in place with a loose hose clamp! 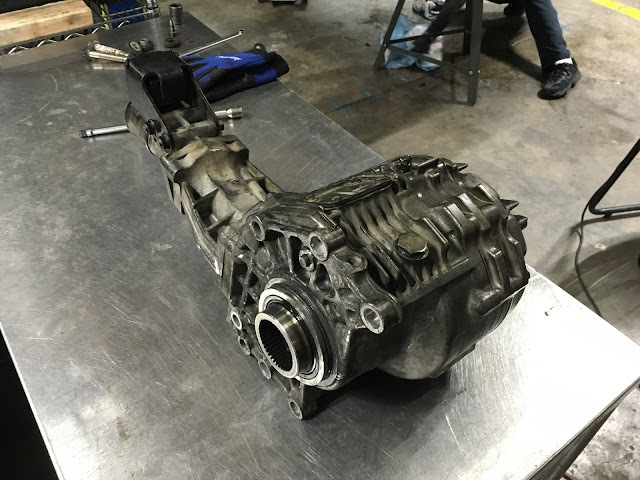 The transfer case also had a severely bent hard line, which can limit fluid transfer. These issues caused some of the many leaks this car had, and could have resulted in serious damage. Remember everyone, sometimes there will be shops or individuals who will offer to do a job for cheap, and often the result is what we have on our hands here. Saving a little money now can cost you a lot of money later, so always use a reputable shop and don’t be too concerned with price! Moving along with our install, we prepped the trans for install and got it bolted back into place. The transfer case went back in and we secured the rest of the front subframe and suspension back in place. We then filled the transmission with fresh gear fluid and the transfer case with fresh factory DiaQueen. The transfer case and AYC system needs to be bled after being drained and filled, so we completed that process as per factory specs. One final step was to recalibrate the steering angle sensor using our scan tool to ensure there would be no issues communicating with the AYC system. A cleanup of the engine bay, and fixing a few final issues (including a damaged MAF wire) and the car was ready for a test drive. 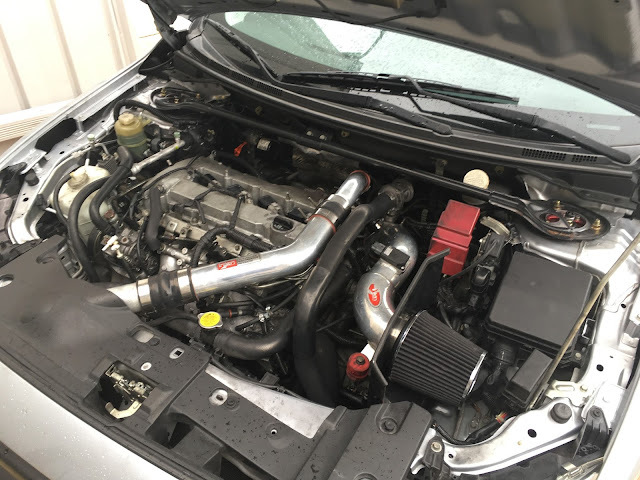 The new clutch kit and repairs had done wonders for this EVO X! The car now drives beautifully and is ready for many more miles of fun. 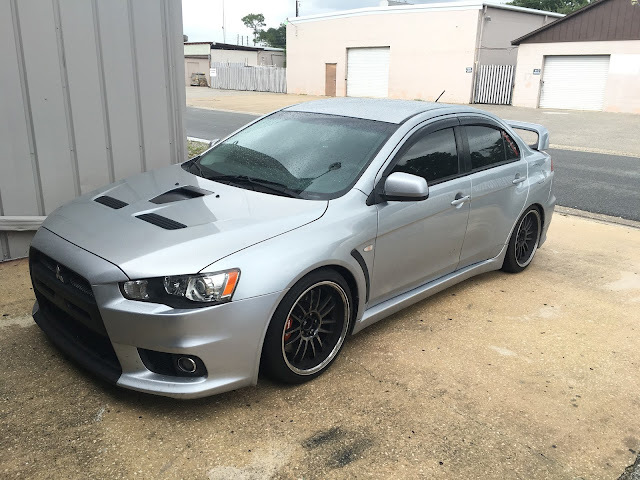 -Circuit Motorsports is a performance tuning shop located in Orlando, FL. The shop specializes in import performance cars from Subaru, Nissan, Mitsubishi and more.